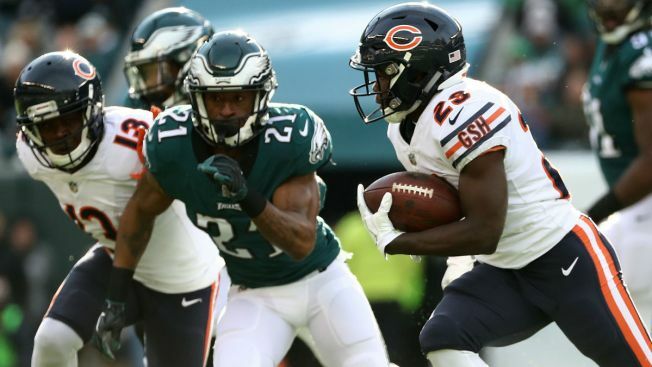 The Chicago Bears were humbled in a 31-3 loss to the high-flying Philadelphia Eagles on Sunday afternoon, and they narrowly avoided making some really bad history. In total, the Bears managed just six rushing yards in the game and 140 yards of total offense overall. They only got back into positive territory on the ground after an 11-yard run by Mitchell Trubisky in the fourth quarter, but it still represents one of the worst rushing performances in the entire history of the team. According to Pro Football Reference, the Bears’ six rushing yards were the second-fewest in a game in team history. Only a 1952 game against the Rams was worse, as the Bears gained just one yard on the ground on 37 attempts in a 31-7 loss in that contest. The Bears totaled 140 yards of offense in the game, marking the first time they’d been held in check to that degree since a 2010 loss to the New York Giants, who won 17-3 at the Meadowlands while holding the Bears to just 110 yards of offense. Meanwhile, the Eagles racked up 420 yards of offense en route to their 10th win of the season.